Stanford marine biologist Stephen Palumbi describes the back reefs at Ofu Island in American Samoa as a tropical paradise with turquoise lagoons of warm water that would please any tourist. 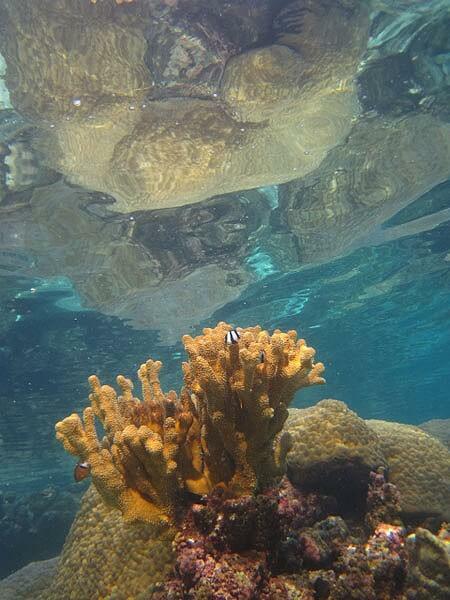 But as the tides wash in and out, Palumbi says the corals that live in the lagoons are exposed to temperatures high enough to kill most reefs. Surprisingly, the reefs are thriving. “In fact, they’re growing faster than the same species elsewhere,” he says. Palumbi and his research team, currently on an expedition to Ofu Island, are trying to find out what makes these corals so tough. Are they unique, or could all corals be this heat resistant? Answering these questions will help his team find ways to protect corals, which scientists worry are at risk as climate change raises ocean temperature. The death and destruction of coral reefs, which are home to an array of fish and other sea creatures, can have devastating effects on communities that rely on the reefs for food and trade. The reefs also attract tourism. “Our research tries to find the corals that are better at resisting the negative effects of high temperature, and find out at the molecular genetic level how they accomplish this,” Palumbi said. To test the corals’ strength, Palumbi, director of Hopkins Marine Station, and his team use a coral stress tank, a computer-controlled aquarium that allows the scientists to heat water to a precise degree. “We place corals from different locations in these tanks, ramp the temperature up over the course of a day and record which of the corals bleach,” Palumbi says. The tanks are simple in design, made using coolers that have been jerry-rigged with fans, floodlights and a fish tank heat stick. They can easily be carried to remote locations and hooked up to laptops that control the water temperature. The first part of the team’s expedition takes place in Ofu Island. Palumbi will then take the tanks on the road for the first time to Rarotonga and Aitutaki in the Cook Islands. Palumbi’s expedition runs through April 7. The team’s travels can be followed on Twitter and through its blog.